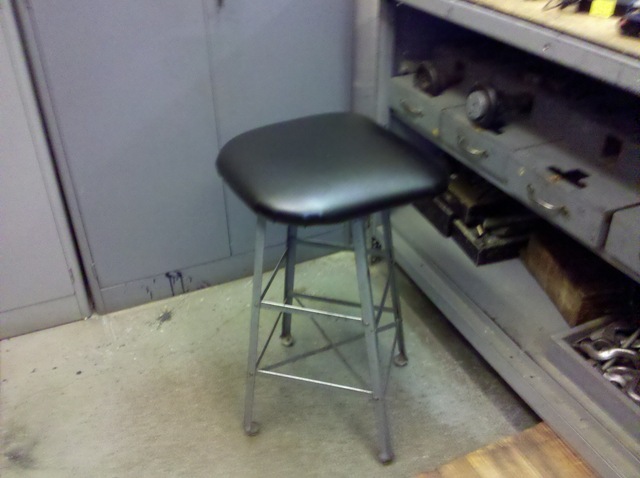 I got in to work the other day and found that Joel had, true to his word, upholstered the new tool crib stool over the weekend. Behold the paddedness. It really helps, too. My six-hour day (Wednesday) is still a pretty darn long one, but the days when I’m only in here three hours, it’s a big help. And it does mean that the Long Day is only partially long, if you’ll forgive the turn of phrase. Our next step is to add some sort of foot rest that’s a bit better than the stretchers in the steel structure. They’re too close to the vertical axis for long-term comfort; I can hook my heels on them, but the position makes my hips sore after a while. I’m thinking a metal ring, maybe three or four inches more in diameter than the diagonal of the base at about the level of the upper stretchers, is the way to go. We’ve got the equipment in here for bending round stock to a particular radius, and once the circle is made it’s just a question of whipping up some brackets and welding the lot together. I can’t weld – the curriculum recommends a class they do for it over at EMCC, but it’s only offered in the spring and I haven’t taken it yet – but Joel can. We just need to finalize a design. The temptation is very strong to go this weekend and do it up proper-like in Solid Edge, make some process sheets, and generally go all Real Engineer on it. I’m not taking a Machine Tool class this semester, but it might be worth a few impress-the-boss points anyway, and it’d be a nice refresher of stuff I did last semester. Keep me sharp for the next CAD class, which is coming this spring. I took a bunch of measurements Monday night. It’ll take a while just to assemble the model of the stool, before I can start making hypothetical modifications – I may have time over the weekend. There’s no school next Monday.